Assuming you’ve read our reviews of the past three episodes of Telltale’s adaptation of Robert Kirkman’s The Walking Dead, you’re aware that we’re big fans of this game. Episode 1 was a wonderful surprise, Episode 2 was even better, and Episode 3 somehow topped both of its predecessors, both from a storytelling perspective and in the gameplay options it offers players. Fans of the original comic book series should be delighted by how excellent and source-accurate this game has been so far, but to be honest with you, I’m running out of ways to praise The Walking Dead. The newly released Episode 4, dubbed “Around Every Corner,” does nothing to change that; Like Episode 2 and 3 before it, Episode 4 is the finest entry in the series to date. While the story of Lee and Clem’s survival amidst the zombie apocalypse in the American Southeast remains the key focus here, there is one big difference that sets Episode 4 apart from its forebears: This episode was written by Gary Whitta. If that name sounds familiar, it’s because Whitta spent years as the Editor In Chief of PC Gamer magazine before leaving to write scripts for Hollywood. To date his biggest film has been 2010’s The Book Of Eli, a dystopian action flick starring Denzel Washington. 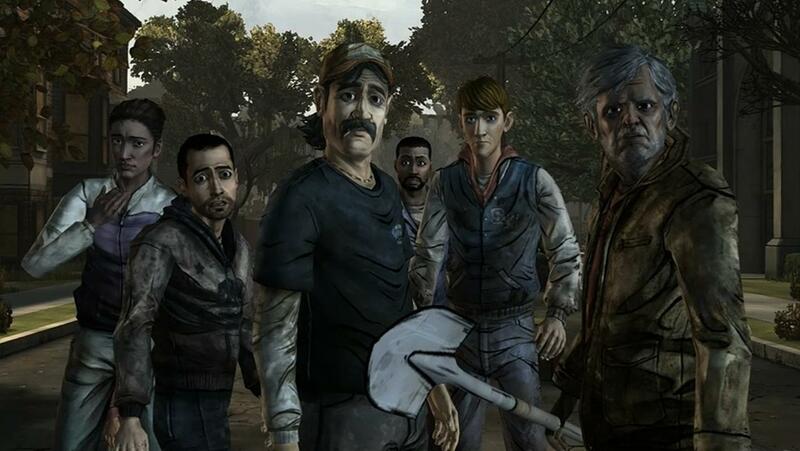 While Whitta has been involved in Telltale’s The Walking Dead since the beginning, his role has largely been that of a supervisory position over the game’s writing team. In the case of Episode 4 however, Whitta has been tapped to write the episode himself. This is probably where you’d expect me to detail all the new, interesting elements that Whitta brings to the story, but honestly that’s not at all the case. Given Whitta’s previous involvement with the series, it makes sense that he would want to seamlessly blend his episode with those that came before it, and in that regard he was very successful. If anything, Whitta’s writing gives players more of the same — excellent characterization, a bleak atmosphere and poignant moments that are genuinely emotionally resonant — and while I generally thrive on novelty, “more of the same” is exactly what I wanted to see from this episode. Of course, that’s not to say that Episode 4 doesn’t bring anything new to the table. If you’ve played through the past three episodes of The Walking Dead, you’re well aware that over time the story in the game, regardless of your decisions, has grown increasingly dark. Death has been a constant companion on this journey since day one, but by the end of Episode 3 most players were likely wondering how many more characters they could stand to see snuffed out before bursting into tears or heading down to the local pub for a stiff drink. Assuming you enjoyed all of that morbidity, I’ve got great news: The ongoing trend of making each episode darker than the last continues in Episode 4. I refuse to drop spoilers for this game, but let’s just say that no one is safe in Telltale’s version of The Walking Dead. Well, actually, scratch that. I will disclose one minor spoiler. That’s about to happen, so those of you who want to go into Episode 4 totally fresh might want to skip to the next paragraph. Alright, now that they’re gone I can point out one excellent early-game example of the tone of this episode: A few minutes into the game your group is trapped in the backyard of a huge house. You’re trying to get inside but the doors and windows are firmly boarded up. You discover a shovel, but this doesn’t seem to help your situation until you discover that the pet door can be unlocked by a chip in the family dog’s collar, and then notice that there happens to be a freshly dug grave next to a nearby doghouse. Being the problem solver that he is, Lee opts to dig up the dog’s corpse, and once the thing is unearthed it’s just disgusting. Imagine those dogs from Resident Evil, except without any skin at all (yet a horrible, biologically-improbable case of mange). As if that wasn’t enough, while trying to get at the dog’s collar the thing’s head falls off. That moment I just outlined serves as a succinct description of Episode 4 as a whole. This episode is gorier than its predecessors, darker than its predecessors, yet at the same time it amplifies the humor that first became apparent in Episode 3. Granted, it’s dark humor, but it still provides a nice contrast for a game that is otherwise eternally focused on morbidity and our characters’ lonely struggle. Mechanically speaking, Episode 4 tops its predecessors as well. Instead of recycling concepts for the various action-focused segments, Episode 4 offers completely new ones. I can’t objectively say that these new mini-games are better than what we’ve seen in past episodes, but I can say that they seem more numerous in Episode 4. If nothing else, this kind of novelty signals that the developers aren’t resting on their laurels, and want to make each episode a unique experience, despite the overarching storyline. I’d like to echo a sentiment that I first described in my review of The Walking Dead: Episode 3: After witnessing the events of Episode 4, I’m genuinely concerned that the only way for Telltale to continue topping itself is for the game’s protagonists to meet a horribly bleak, depressing end. Mass suicide? Being torn apart by the undead? Starvation in a dank basement? Whatever the end result, I don’t see a rosy future for these characters. Why is this a part of my conclusion? Because it’s the highest praise I can pay this game. Though I predict horrors for everyone involved in this virtual situation, it absolutely kills me to think about it. Over the course of these episodes I’ve grown intensely fond of these characters, and feel real, legitimate anger and sadness whenever one of them dies. Given the adventure game genre’s reliance on quality storytelling, it should be seen as a massive compliment that Telltale is able to create this level of emotional attachment between a real person and one comprised of pixels. Now let’s just pray that Episode 5 arrives as soon as possible. Grisly as it might be, I can’t wait to see how this story ends.